The WBO interim featherweight world title will be on the line when Carl Frampton and Nonito Donaire clash in a blockbuster bout at the SSE Arena in Belfast on April 21, live on BoxNation. Supporting the main event is Republic of Ireland’s Luke Keeler [13-2-1] who will take on Northern Ireland’s Conrad Cummings [13-1-1] for the WBO European title. Keeler has had ups and downs in his career with lots of learning curves in his 5 year career as a professional boxer. “I’m happy enough; I’ve had a couple of good learning fights. I’ve been in Prizefighter – I damaged my hand in the first fight against Luke Crowcoft. It was a close fight [Tom Doran], it was a three round fight and I didn’t take a lot from that. I learned lessons and I didn’t really class it as a defeat. Keeler rates Cummings as a quality fighter, and he can’t wait to share the ring with him. Keeler is taking the fight serious and he revealed to RingNews24 he has made big changes. A rematch took place in February against Adam Jones, an opponent Keeler beat on points previously. Referee John Lowey scored the fight a draw at Keeler’s disappointment. “The guy that I fought, he came in a good bit heavier – he’s upset a few guys, he’s a decent boxer. I thought I won the fight comfortably. It was a four round fight and the referee scored it a draw. I think everyone in the place thought I won – I was shocked at the result. “It got the cobwebs off me – I had surgery at the end of September in my shoulder, I had a tear in my shoulder. I got bicep roots connected into my shoulder. I wasn’t punching for a couple of months and I’ve been easing in with my training. It was good to get the cobwebs off in an actual fight. I didn’t take a lot from the fight. The referee called it a draw but, to be honest, I thought I won comfortably – Jones probably won a round. Keeler feels he is the better fighter. Both fighters fought on the same bill recently in Belfast. Keeler caught the Cummings fight but wasn’t overly impressed. Carl Frampton tops the bill against Nonito Donaire, Keeler shared his prediction. Keeler is focused on the challenge that lies ahead, but he has set a long term goal. “I’m fully focused on April 21 – I’m not looking past that and then I’ll push on and then go from there. 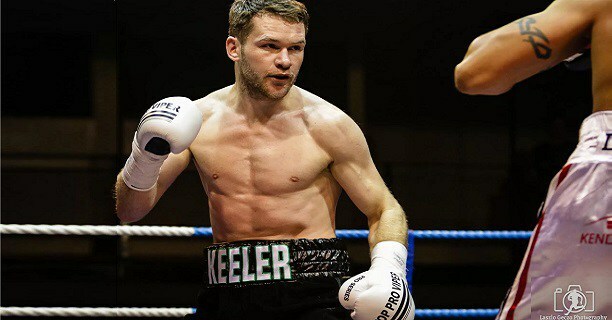 Luke Keeler would like to push for a world title in 2019 and he believes he can achieve this with the backing from MTK.